Viber has announced that is is allowing users to make free Viber Out calls to both landlines and mobiles between the U.S. and the seven countries affected by Trump’s travel ban. Viber has updated its iOS app to add a range of improvements based on user requests, says the company. Version 5.5 allows you to start a video call directly from your recent calls list, rich links now display content previews when links are posted into text chats – and Viber says more efficient data compression has allowed it to improve the quality of both audio and video calls while reducing data usage. Users can also now share contacts within both one-to-one and group chats, and invite an entire group to follow a public chat. Viber is a free download from iTunes. FaceTime and Skype have long been popular ways to make free video calls to your friends and family from your iPhone and iPad, but Viber has now joined the party. While video calling has been available on the desktop version of Viber for some time, the mobile app had previously been limited to voice, text and photo messages. Make video calls from your phone to other Viber contacts on mobile or Desktop. You can also transfer video calls between mobile and Desktop! The USP of Viber is that no username is needed – only your mobile number. When a contact joins Viber, the service spots that their number is in your contacts app and sends you an alert to let you know. Viber is a free download from iTunes. 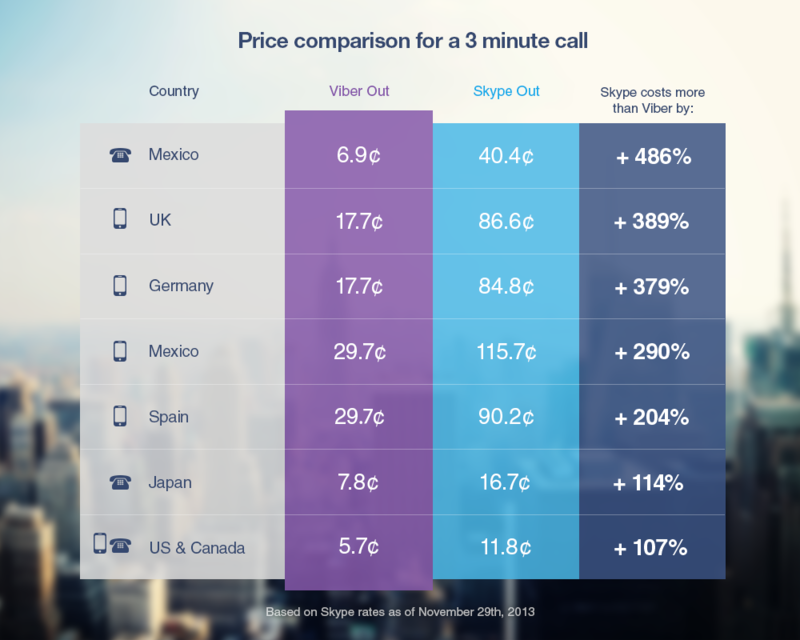 Voice and video calls between Viber users are free (bar any data charges on LTE/3G). The company makes its money by selling stickers and offering low-cost outgoing calls worldwide. Viber, the popular cross-platform VoIP app, released Viber 4.1 for iOS today. The new app introduces a new calling feature called Viber Out. This service allows users on any supported Viber platform to place outgoing calls to any landline or mobile number in the world at rates lower than many other similar offerings. Viber Out also allows users to use their real phone number as their caller ID, meaning the party on the other end will see your number as if the call was coming from the users phone, so there’s no need for your contacts to save a new VoIP number in order to recognize you. Viber 4.1 is rolling out for iPhone now on the iOS App Store. Popular messaging and VoIP service Viber just updated its iPhone app with a number of new features that first hit Android devices yesterday. The update brings “doodles”, a feature that lets users draw on top of photos before sharing. Also new in version 3.1 of Viber is the ability to see when a recipient has viewed a message with “Seen” status notifications. The Hacker News is reporting that communications app “Viber” has been hacked by the Syrian Electronic Army, a “pro-Assad hacker group”. In addition, their support webpage was defaced before the company took the page down. Support.Viber.com currently leads to a “403 Forbidden” page. It is unclear if the SEA is planning on using this information or if their sole intention was to expose the tracking information stored in Viber’s database. Each record in the database stores the UDID and IP address of each call, however, one may presume this information is stored for purposes other than tracking and spying on its own users (e.g. presenting the data to the proper law enforcement authorities upon request). We’ve asked Viber to comment about the scope of the hacking and defacing and will update this post if new information arises. Update 2: The maker’s of Viber’s customer service helpdesk software Kayako have responded to the situation as well, noting that it is an isolated situation and the email phishing was the vulnerability that allowed for the hacking. The security of our customers’ helpdesks and data is our highest priority. As Viber said in their statement, this looks to be an isolated compromise of an individual’s account. Even so, we have taken the precautionary measure of auditing our systems. At this time we have no reason to believe that any other Kayako system or customer has been affected and we will continue to monitor the situation.